Today’s guest of CSReview is an international award-winning author whose work has been commended by such notables as the late entertainer Danny Thomas, phenomenal actress Ann Jillian, and the late but forever cherished Princess Diana. Ladies and gentlemen, meet Emmett O. Saunders III. CS: Welcome to CSReview, Emmett. You chose a particular writing genre to channel your creative vein. Any reason why religious fiction appeals to you? Emmett Saunders: Thank you for the invitation from CSReview. Religion has always been a big part of my life. In fact, my first story AN IRONY OF TIME, written in high school, concerned a small town church which is uprooted physically during an earthquake. The various characters in the story were forced to confront their faith or lack thereof in dealing with the catastrophe that beset them. I believe religion plays a vital role in helping us through life. No matter what we believe, as long as it’s rooted in a Higher Being that looks favorably on love and concern for our fellow travelers on the planet, we can use faith to move mountains. So, genre doesn’t necessarily limit me as far as expounding on the benefits of a strong connection with that Higher Being. I’ve utilized that sense of faith in sci-fi, children’s fantasy, family-oriented drama and adult suspense-thriller types of stories. Oftentimes, the immorality and violence of daily life serves to focus attention on the horrible aspects we face in dealing with circumstances beyond our control. But, learning that change is inevitable, we do learn, hopefully, to see beyond a momentary high stress situation and put our faith to work in ways to overcome the problem and appreciate better times in our lives which are also fleeting, yet made to be enjoyed to balance out everything. As the old saying goes, too much of one thing can be boring. In life, there’s adventure, challenge, change and that’s my duty as a writer to explore and examine those aspects wherever they appear and in whatever form they may present themselves. CS: I hear you. What you are saying goes right on with my next question. Let´s talk about your source of inspiration. Where do you draw from? Emmett Saunders: In the beginning, I was inspired by the best writers who were my constant companions in books. I read incessantly after my sister had taught me to read before I ever attended first grade. I was reading comics in the paper, books from the library, at a rate of about four or five a week and I became fascinated with “out there” television shows in my childhood like: My Living Doll, My Favorite Martian, Lost in Space, Batman, Superman, Mr. Ed, Lassie, The Addams Family, The Munsters, Miss Frances’ Ding Dong School, Captain Kangaroo, Bewitched, The Flying Nun, I Dream of Jeannie and the staples such as Leave It To Beaver, Gilligan’s Island, Room for One More, The Farmer’s Daughter and Hazel. Movies, similarly, were a big event which marked me for life. A lot of the Walt Disney ones imbued a sense of adventure in me: In Search of the Castaways, The Moonspinners, Pinocchio, Sleeping Beauty, Snow White, etc. Later, I graduated to more integrated storylines with music such as: The Sound of Music, Mary Poppins, Camelot, Oklahoma, Carousel, etc. And the two biggies were Gone With The Wind and The Wizard of Oz. I became fascinated with exactly what drew me to these films in the first place and what could possibly keep me viewing them over and over again. For example, I’ve seen Gladiator approximately 765 times and Amadeus about 650 times. This included theater viewing as well as home viewing after the DVDs became available. Story lines are very integral for holding my interest but the characters as well as the way they’re portrayed by actors and actresses can add or diminish the feelings that well up inside while enjoying the performances. This then, became a focal point for me in honing my writing skills. I read Shakespeare, Cicero, Plato and a host of other writers who looked at the human condition and incorporated what they felt from life into their work. And that, in essence, is what I found a significant enlightenment, as a writer, to draw from in constructing a well-written story. I found the ARABIAN NIGHTS mini-series a very good “Aha” moment when the storyteller told Scherezade in order to keep the listener’s interest, you had to grab them within the first ten or twenty seconds, build the story and end each chapter with a cliff-hanger type of carry-through to the next level. And in writing my Christmas stories, I began with the simple emotion of being overwhelmed by the commercialization of the season, integrating that into a refocusing on the two major aspects of Christian belief, the Christ Child’s birth and St. Nicholas delivering presents. Over the years, I found many sources of inspiration from my surroundings and people who came and went in my life. That was similar to Frank Baum’s incorporation of the same elements in his writing of The Wizard of Oz series. For the most part, I took the drive for writing from my favorite book LITTLE LAME PRINCE where he was dropped at birth, given a flying cloak by his fairy godmother to see the kingdom that his uncle had usurped and, in the end, acquired the throne and ruled peacefully thereafter. I like the Grimm’s fairy tales, but sometimes the scary aspects aren’t mitigated by the happy endings. You see that as an adult in reading the stories, but not as a child. Yet, again, the feeling is all important. And, as a writer, I find that connecting to the reader’s feelings, much like that found in music, will lift a story from merely mediocre to a greater understanding and appreciation for life. Again, that’s what makes the best films as well when music, writing and performance all work together (maybe not equally) to draw the viewer into a better view of life. CS: I am in awe of Shakespeare and Gone With the Wind, and many other classics you mentioned, both in literature and film. What can you say about most common challenges for authors in your genre? Most unique ones? Emmett Saunders: I think the most common challenge is to avoid contrivance, either in plot or character. So what if you’ve outlined the most outlandish possible scenario for getting things in motion. A college professor friend of mine, after viewing the beginning of one of my sci-fi stories, noted that the characters were flat, everything seemed focused on the plot and all the wonderful scientific mechanizations around them. If you don’t connect with the characters on an emotional level, good or bad, then the writer has lost the listener and no leap of faith into that situation can be achieved. So, I avoid designing characters and prefer to draw characterizations from live people around me, past and present. I may integrate several personality aspects of the people into a single character, but in no way can I “believe” in a character’s existence without real people to base them upon. It’s sort of like an artist trying to imagine what he or she is painting without the benefit of having actually experienced the interaction with the subject. Who can forget the monumental aspects of the Mona Lisa, Michelangelo’s David or the Venus de Milo? Ditto with architectural masterpieces such as Mount Rushmore, the Statue of Liberty, the leaning Tower of Pisa, the Pyramids of Egypt or the Colossus of Rhodes. When something is done right, it becomes a valued part of civilization and the collective unconscious of mankind. It will be remembered through the ages for its beauty, structure and contribution to lifting mankind higher in its appreciation for life. The most unique challenge for any writer is complacence. Don’t be satisfied with what you’ve done before or become scared that you have lost the impulse or drive for writing something worthwhile. I’ve put aside writing certain stories for years and come back to it, able to pick up exactly where I left off. The intervening time can bring something fresh to the picture and incorporate still more in the body of the work and/or characterization. Things don’t have to spring “full blown” into your head when you write. I found in writing THE SHAMROCK RUNNER, which took nine months, that little insignificant (to me at the time) things came back at the end to major considerations. This, I attributed to taking small breaks in the writing, and my subconscious mind having already plotted everything out before I ever began putting the words down. So, don’t settle for less than your best. And always have faith in your ability, no matter what form of insecurity may creep in, before you start or throughout the process of completing a work. CS: You published at least one of your titles with Publish America. What can you tell us about your experience with them? Emmett Saunders: After I had self-published my first book, THE BELL WISHERS (children’s fantasy), I was desperately searching for a way to get my work into print without having to come up with a great deal of money in order to get it done. I was working on two different books at the time, REINDEER ON THE ROOFTOP (Christmas story anthology), drawn from my original story of THE NIGHT THE REINDEER FLEW, and THE SHAMROCK RUNNER (adult suspense thriller). I came across an advertisement for Publish America and responded to it. The company is based in Maryland and seemed open to both of the manuscripts, so I investigated further. I was amazed that they were on the edge of the new publishing genre of printing on demand. If your book was accepted, they would design a cover, based on your suggestions and print it as demand warranted from the buyers. It seemed a good deal. And I was chomping at the bit to get both of these books into print, so I didn’t really think about further details. I was pretty much fed up with a select group of publishers in the country pretty much dictating what the public reads. What if there was a writer who had the best book in the world ready to go and because someone at the publishing company had a bad day, that book would never see print. I’m sure it happens. And as I later corresponded with a writer friend in Ireland, she told me that she had followed the print-on-demand avenue as well with successful results. What I didn’t realize at the time was the writer would be responsible for marketing the book once it was published. And, the publishing company holds the ISBN registration number for the book, so the writer is locked in to dealing exclusively with the same publisher, unless you’re willing to buy back the ISBN number. As the Internet blossomed, I had an inspiration to convert my books into e-book formats and publish them that way. Unfortunately, the contract stated that the publisher has the exclusive rights on the books for seven years to do that as well. However, those rights do not extend to screenplay adaptations, so I focused myself on learning that craft and eventually turned my attention in that direction. I believe print-on-demand books may be on the way out as the e-books become more widely accepted and environmentally sound. No tree is killed in the process of getting your work into print nowadays. And, with the advent of e-books, you now have a new industry that can help writers design their books by themselves or with company assistance. It’s truly the best of both worlds at limited costs in terms of publishing. Of course, the time and effort involved is strictly on the writer in promoting the books, But, with Publish America they continually wanted the writer to buy his or her own book, in fairly large quantities, and cooked up promotional venues to get your book in the hands of well-known writers and celebrities. I didn’t succumb to that angle. What would those people have to do with promoting your book? So, I have embraced the e-book phenomenon of constructing my own work and I’ve been quite satisfied with subsequent books of mine: LIFE WINDS (poetry anthology) and CRATERS OF THE SUN (sci-fi anthology) which are available in both Nook and Kindle formats. Instructions are very easy to follow in submitting books and can be found on their websites. CS: It´s nice to hear that you found your balance and was able to smoothen certain angles. What are you currently working on? Where do you see yourself – as a professional writer – in five years from now? In ten? Emmett Saunders: I’m currently working on CONVERSATIONS WITH JESUS (religious drama) both in e-book and screenplay format, TIMESTREAM (sci-fi thriller screenplay) and MOON BABIES (supernatural mystery in e-book format). As a professional writer, I’m always hoping for time to work on stories, concepts and ideas that develop into viable and profitable means of communicating adventure and enlightenment to readers. I am always open to new contacts, friends and situations to learn about life, so in five years, I would imagine new options would present themselves for just such opportunity. In ten years, as I’m quite old already, I would hope to have the energy to continue writing for enjoyment and keeping active. Inside, I know my soul is the same age as it was at birth, because the soul doesn’t measure time, merely growth. However, for all practical purposes, I have to realize the pressures of the aging process and I know it may take more time to convey the stories based on physical limitations. For the sake of readership, though, I will continue to make the effort. Thanks again for inviting me to CSReview! CS: Thank you for being here today, Emmett. Wishing you success for your new titles and all the best in life. 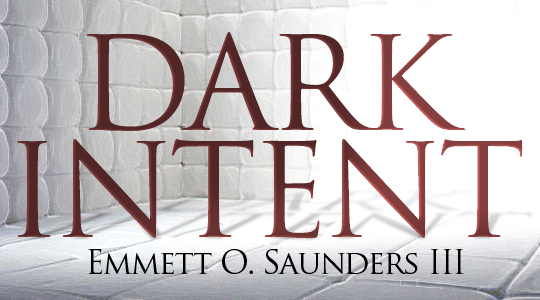 To sample the author´s style, read Dark Intent, a short story by Emmett O. Saunders III, on A Book’s Mind.